Trixie glanced behind her. Harrison's derby hat sat neatly in the exact middle of the backseat. It looked as dignified and as correct as its owner. "Why was Di so anxious about it?" she asked. "Oh, you know Di," Jim answered vaguely. "I think she just wanted to show the rest of the staff that she was able to look after everything. I can understand it." Trixie frowned. "Well, I don't understand it at all. It's not like Di to be so bossy." "Maybe, Trix," Jim said gently, "it's because you're so used to running things yourself." "But I'm not bossy," Trixie cried. Jim grinned at her to take the sting out of his words. "Oh, sometimes you are. Just a little bit, maybe. But then, I guess someone's got to be the boss." Trixie wasn't sure she liked this thought at all. "I thought we were all bosses," she said slowly. Jim decided to drop the subject. 16. "The Butler Did It!" The Bob-Whites plans for a fundraising Bazaar go awry when Harrison, Di's butler, goes missing. The search leads them to Sleepyside Hollow where they find Harrison injured and locked in the cellar and Trixie suspects there is more to the story than he is letting on. Her suspicions cause a rift between her and Di which widens as Trixie tries to find a missing vase and clear the name of a dead man. Did the butler really do it, and can Trixie use a simple riddle and the mysterious alphabet trees to solve the mystery? 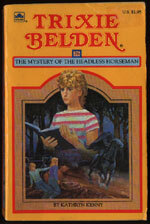 Or will she and Honey be frightened off by the headless horseman that rides the woods of Sleepyside Hollow? Rose Crandall - the owner of Sleepyside Hollow and widow of Jonathan Crandall, former curator of the Sleepyside Museum. Alfred Dunham - he stole the Lynches Lien-Ting and tried to steal the vase from the Bob-Whites at gun point. Di, Honey and Trixie are said to be in the ninth grade, while Dan and Mart are sophomores and Brian and Jim are seniors (p. 18). Regan must have received a promotion from groom to trainer: 'His uncle, Bill Regan, who was the Wheelers' horse trainer...' (p. 29). 'Trixie glanced at her sharply. What was wrong with Di? She had a funny lah-di-dah tone in her voice that Trixie had never heard her use before. It was almost as if - that was it - as if Di was playing a part on the stage. 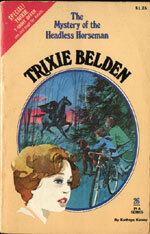 Trixie was a 'candy striper' but in #16 The Mystery of the Missing Heiress, she was a 'volunteen' (p. 132). LOL! Trixie accuses Jim of not noticing anything (p. 137). 'Trixie had a sudden idea. "Oh, Henry, forgive me!" she whispered. Then in a loud voice she called, "Reddy! Don't chase the cat!" In one second, Reddy was in the room. In another second, he had dashed between a pair of legs in dark trousers. Their wearer didn't have a chance. His legs shot out from under him just as his fingers were closing around the precious box. "Get him, boys!" Brian yelled, diving for the gun. Jim, Mart and Dan joyfully obeyed. There were sounds of a loud scuffle on the floor. Then there was silence. From the top of a bookcase, Henry yawned and began to wash himself. Reddy, who had not come anywhere close to catching him, looked bitterly disappointed' (p. 207-208).